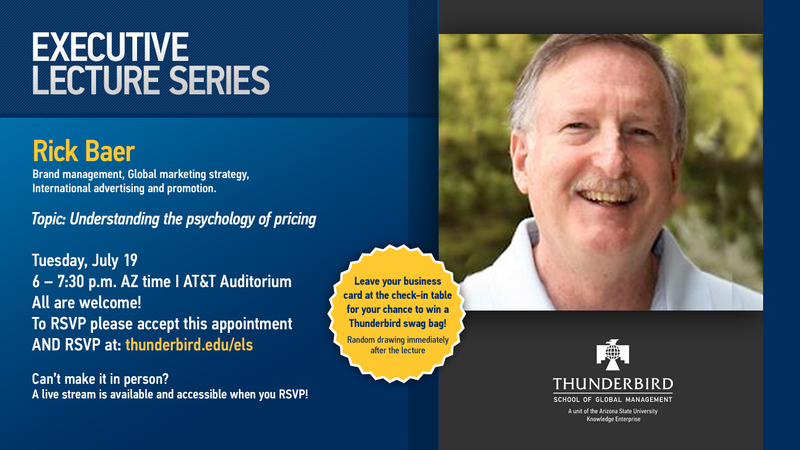 Last Event: Tuesday July 19 6 p.m. - 7:30 p.m.
Executive Lecture Series: "Understanding the Psychology of Pricing"
Join Rick Baer for this discussion of how people’s emotions impact their understanding of pricing. He will be sharing a number of principles that businesses use to maximize prices by capitalizing on the ways we think about them; he will talk about how people often make irrational pricing decisions because psychology plays such a big role in the pricing process. And finally, you’ll learn some of the rules of pricing sensitivity, based on some of these psychological insights. It should be a fun session with many examples from everyday experiences.